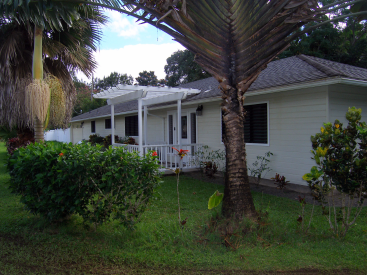 Updated home in Wailua Homesteads offers four bedrooms (two are master suites) and three bathrooms. The home is in excellent condition. Single-story living with 2436 sq ft of living space on over 1/2 acre with an abundance of fruit trees, spice trees and plants and flowers. Many recent upgrades include: •	The kitchen has new cabinets, a breakfast bar, pantry, lighting, tiled floors, granite counter tops, a center island and stainless steel appliances. •	The living room has new wood flooring. •	Built-in cabinets in the dining room provide additional storage and display. •	The Master Bath offers a large fully tiled walk-in shower, dual vanities, upgraded cabinets and tile flooring. Walk-in closet with sky tube. •	Master bedroom, second and third bedrooms have wood laminate floors •	The third (full) bathroom has been updated. The very large Guest Bedroom/ Bath suite is separated from the main living area by a large rear entry all- purpose room. The guest bath has a jetted tub and large walk-in shower. Guest Bedroom has hardwood floors and is large enough to accommodate a sitting area or office area. Two car garage. Lanai is covered with a trellis. Solar roof/attic fan in the main living area. Enjoy mango, avocado, lychee, coffee, mountain apple, starfruit, Japanese persimmon, clementine, cara cara, blood and navel oranges, banana, Jamaican poinsettia, meyer lemons, nutmeg, allspice, bay leaf, Hawaiian cherry, cinnamon, turmeric, many ginger flowers and even a blueberry and a miracle berry bush. The back of the property provides a personal park-like setting that abuts the Opaekaa Stream that flows to Opaekaa Falls. Furnishings not included but many items may be available through a separate Bill of Sale.